News from the series finale in Toronto. So, so many factors in this game. One other: Kendrys Morales was only 6 of 28 vs Sale before the ninth but two of the hits were homers. Sale: “I’ve said it for years, there’s two stats that matter: win and loss. It’s not mine. You’re trying to win games, that’s it." Bogaerts jammed his left thumb sliding into second. He said he felt OK but hedged a bit on whether he would start tomorrow night. Farrell did acknowledge that the replay delay helped lead to Kimbrel coming in. Opponents are 15 of 102 (.147) against Chris Sale with 42 strikeouts. TORONTO – Mookie Betts hit a three-run double in the top of the 10th inning to lift the Red Sox over the Blue Jays, 4-1, in the final game of their series. Xander Bogaerts hit an RBI single in the top of the ninth inning to break a 0-0 tie, driving in Mitch Moreland, who doubled with two outs. Bogaerts was thrown out at second trying to stretch his hit. Red Sox closer Craig Kimbrel gave the run right back in the bottom of the ninth when the first batter he faced, Kendrys Morales, belted a solo home run to send the game to extra innings. Chris Sale pitched eight shutout innings and struck out 13. The win should be thanked for its service then sent to a nice farm upstate with the other useless stats. Three-run double for Betts and the Sox lead, 4-1. Kimbrel would get the win. Please, just kill the damn win. Now he runs for Leon, Marco Hernndez at second. Dont you run for Sandy Leon here? Betcha that replay review is what got Kimbrel in the game. Gave him time to get ready. Sale threw 111 in his previous starts, 9 fewer than today. Morales homers. Kimbrel’s streak of 25 saves in a row ends. Second guessing for days on that one. Wow, Sale is out. Kimbrel has the 9th. Sox had gone 18 innings without a run. … Kimbrel warming now but have to think Sale stays in. Here is where you need the little oppo single by Bogaerts. Sale is at 102 pitches. Nobody warming up. He might fight anybody who comes to the mound at this point. #RedSox have gone 18 innings without an extra-base hit. With Ks 10 and 11 in the 7th inning, Sale is the first Sox pitcher since Pedro in '99 with 10+ Ks in 3 of his first 4 starts of a season. Sale struck out the side on 10 pitches in the seventh. 11 strikeouts overall on 89 pitches, 70 strikes. My goodness. The only good offensive news for the #RedSox at this point is that Estrada is at 106 pitches and the Toronto bullpen is up. The #RedSox to this point have scored 3 runs in the 25.2 innings Chris Sale has been on the mound. With 7 Ks in 4 IP, Sale has K'd 37.9% of batters faced in '17, tops in MLB. Red Sox record by a qualifying starter is 37.5% (Pedro in '99). Baseball is eternally mysterious. Sale throws 32 of 36 pitches for strikes then walks Steve Pearce (.158) on four pitches. Baseball is eternally mysterious. Sale throws 32 of 36 pitches for strikes than walks Steve Pearce (.158) on four pitches. Sale through 3 innings: 31 pitches 28 strikes. Mookie Betts has struck out two times in a row. It’s the longest streak for a Red Sox player since yesterday. Chris Sale attacks hitters. When he retired the side in the 1st inning, it took two minutes and 24 seconds. If you can, rewind NESN to the pitch Sale got Bautista on. That’s the “back-foot slider.” Can’t do much other than take it and hope. TV/Radio: NESN, MLB Network / WEEI. Bunch of Canadian school kids just did an excellent Star-Spangled Banner. Pregame notes: The Sox head to Baltimore after the game for a three-game series against the Orioles. … The Sox are 2-4 on the road. … Andrew Benintendi is 9 of his last 17 with three doubles. … Kevin Pillar is 6 of 9 in this series for the Blue Jays with three doubles. … Sandy Leon is 2 of his last 21 and this season is 3 for 23 batting lefthanded with seven strikeouts. … Estrada is 4-4 with a 3.91 ERA in 10 career games against the Red Sox. … Dustin Pedroia is 1 of his last 12. Price obviously hit some bump on the rehab road, which happens. But he was throwing with extension and zip this morning. Farrell said he's not giving up on the idea of Hanley playing 1B. But it may not be until the series at Milwaukee in May. Price will throw a bullpen tomorrow. But Farrell acknowledged the recent slowdown was the result of "soreness." Still, threw hard today. 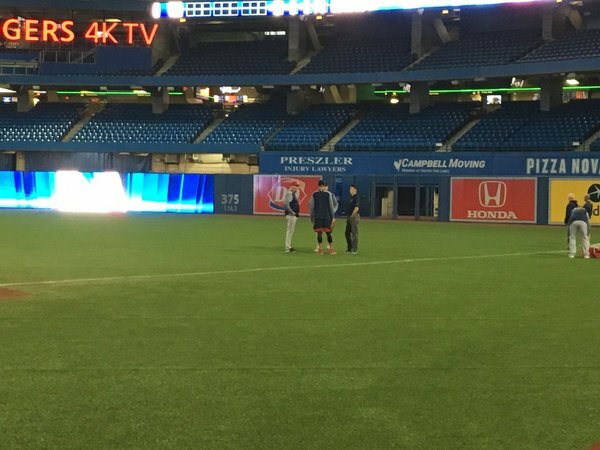 David Price out playing long toss. Being closely monitored by Farrell, the trainer. But he is turning it loose. Pitching: RHP Marco Estrada (0-1, 3.50). Pitching: LHP Chris Sale (1-1, 1.25).